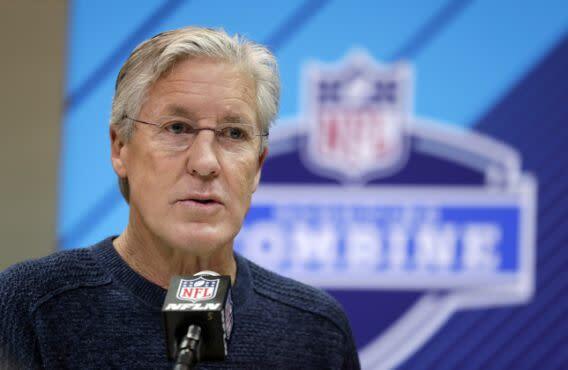 Seattle Seahawks coach Pete Carroll invited University of Toronto psychology professor Jordan Peterson to speak to his staff Thursday, and tweeted out a picture of himself and his guest speaker. But after looking into Peterson, one thing is clear: he’s a strange choice as a guest speaker for an NFL team. In many ways, he is also a right-wing Internet celebrity. Peterson’s YouTube channel has over 1 million subscribers, and he has more than 660,000 followers on Twitter. Peterson recently talked about the “disappearing masculinity in America” in an interview with Fox News’ Tucker Carlson. In the interview, Peterson said that “centuries of oppression of women by men is an absolutely, reprehensible, ideological re-write of history,” and that this is what is taught largely in schools and universities, and that this is harming young boys. In an interview with Vice News, Peterson said that women who have been abused and harassed in Hollywood — which has sparked the #MeToo movement over the past year — have contributed to their own harassment. Peterson has been a very visible opponent to a Canadian bill outlawing discrimination based on gender identity and expression, and he got into a fiery interview with Channel 4 News in the United Kingdom that has been viewed more than 9 million times on YouTube. Again, it’s unclear what Peterson talked about on Thursday in Seattle. However, based on his history, his book and the reaction he constantly draws on the internet, Peterson seems like a strange choice for a guest speaker — especially in a league as diverse as the NFL.